The 349-acre Warriors Path State Park lies very near the famous path used by the Iroquois in raids and wars with the Cherokees and other American Indians in southern Pennsylvania. The park is a seasonal, day-use area open from mid-April through the end of October. At other times of the year, visitors must park near the main gate and walk into the park. This finger of land is bounded on three sides by the Raystown Branch of the Juniata River, which empties into Raystown Lake approximately one mile downstream. The unique shape of the park was formed as a result of river meandering. This section of the river exhibits some of the best examples of natural stream meandering in the state. The park is open every day of the year, sunrise to sunset. Day-use areas close at dusk. The park entrance road and other areas are open specific seasons and hours. Contact the Canoe Creek State Park office for facility seasons and hours. The park is in Liberty Township, Bedford County, about two miles south of the Borough of Saxton on Warriors Path Park Road. 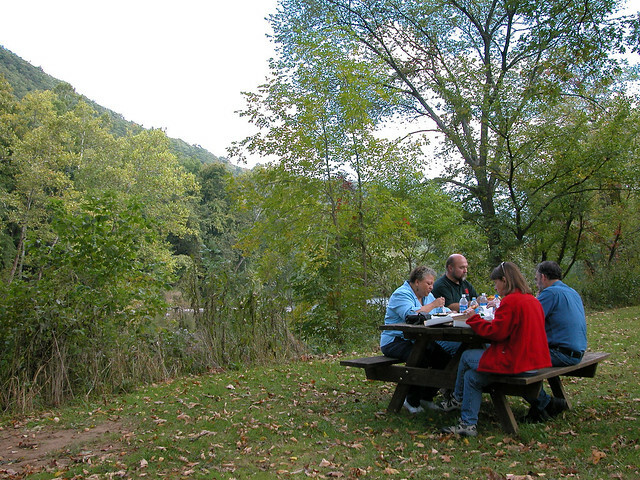 Numerous trails provide easy access to unique areas that can be observed and studied alone or through special request programs as park staff is available. A variety of old fields, wetlands, and woodlands invite exploration.